Very little was known about this photograph until Special Collections staff at State Archives decided to take a closer look — quite literally. Under high magnification and some considerable squinting, the sign above the man standing in the doorway was found to read “S. M. Jones” — beside it, a crudely painted boot. First, where is this? Keen eyes will certainly spot the Sir Walter Hotel in the distance at the corner of Fayetteville and Davie Streets. So, we know it’s in Raleigh and we know it’s on Davie Street. A quick look in a Raleigh city directory indicates that at 212 E Davie Street there was a shoe shop owned by Sherman M. Jones. If the man turned his head to the left, he’d be looking at present day Artspace. But when? Based on several factors including the buildings in the picture, it can be generally dated to the 1920’s. However, a closer look at the photograph reveals a clue that dates the photograph down to the year. 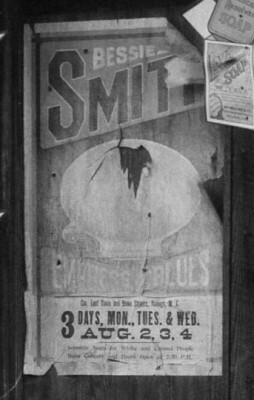 The poster on the side of Mr. Jones’ shop advertising a performance by the legendary blues singer Bessie Smith is the key. The poster lists days of the week that correspond to specific days in August — Monday, Tuesday and Wednesday; August 2nd, 3rd, and 4th. During the time period in question, this happened twice — in 1920 and 1926. The picture couldn’t have been taken in 1920 because the Sir Walter Hotel was built in 1924. So, we can say definitively that the picture was taken after the first half of 1926. Given that the poster looks slightly weather-beaten and the trees in the picture have no leaves, it is very likely that the picture was taken between late fall of 1926 and early winter of 1927. The human element in this photograph makes it very intriguing. That human is thought to be the Sherman M. Jones (~1865-June 12, 1932) listed in the Raleigh City Directory as the proprietor of the shoe shop. He was born to James and Josephine Jones and had 5 siblings; Clement, Jane, Emma, Washington and Eveline. Clement, his older brother, also happened be a shoemaker. Prior to 1910 Mr. Jones is listed in Raleigh city directories as a day laborer. It is possible that he picked up the trade from his brother to make a move toward lighter, more skilled work. In 1896 on the 30th of April, Mr. Jones married Emma Alson, a cook. They stayed married until her death in 1929. When it comes to Sherman M. Jones, there are more questions than answers. No one will know why the photograph was taken, if he was a nice man, a sad man, why his apron was so white, if he missed his wife, or if he was a Bessie Smith fan. These impossible questions are as priceless as the print itself. They keep us thinking, wondering, searching, and archiving. Most excellent history! Thank you, Ian! “They keep us thinking, wondering, searching, and archiving” … all for the love of of history and its unanswered questions! Thanks for the post and the photos. Great detective work Ian. So interesting on so many levels. And now I’m on my sixth Bessie Smith song. Thanks for sharing! what about the structure itself? 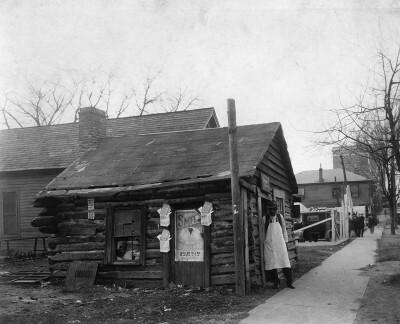 It was obviously already decrepit in 1926, and certainly looks pre-Civil War–were they building log cabins this close to the middle of the city post 1830 or so? Great post, Ian. Have you been able to determine where on the block this would have been? I would think the Founders Row owners who are on that location would find this very interesting. I think we tend to forget how much progress has been made over the years. I can remember (I am 65) when the last privy on our street in Caraleigh was done away with. This was around 1958. We had a bathroom but it was too hard to heat it (it had been added on) so in the winter we bathed in the kitchen in a tin tub. That his wife was a cook meant, more than likely, that she worked for a white family, so it would behoove her and her husband to live nearby. As a cobbler, he would no doubt go around looking for shoes to fix, although I am sure some came to him. He would have been making a living, but not so much as to be in position to improve the building, assuming he owned it.